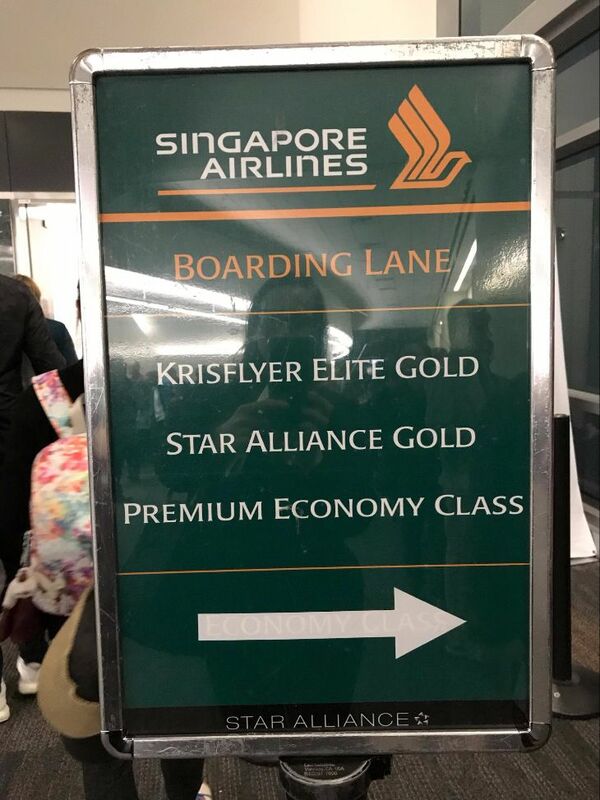 I recently had the pleasure of traveling from San Francisco to Hong Kong and back in Singapore Airlines’ new Premium Economy cabin with my mom thanks to Chris and the wonderful people at Singapore Airlines. 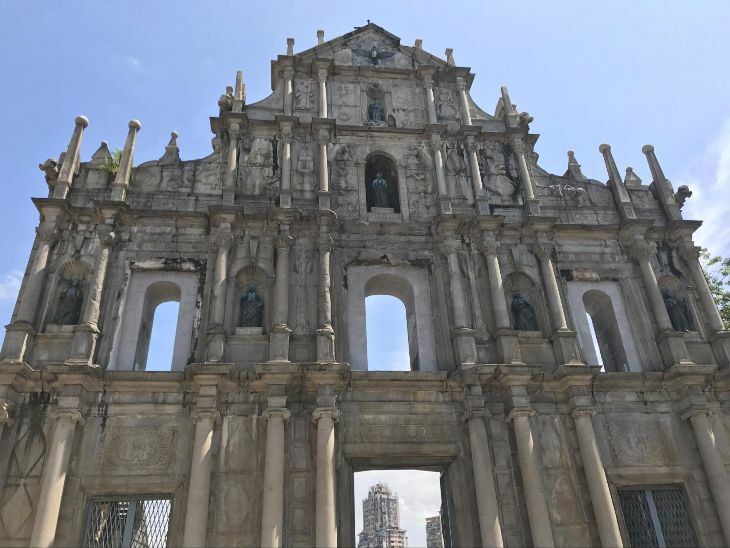 Note: This Trip Report is written by TravelSkills reader Lacie Rhodes who won two roundtrip tickets to Hong Kong on Singapore Airlines as part of this contest. Thank you Lacie for a thorough, honest and helpful report about your Singapore Air experience and your time on the ground in Hong Kong! We booked our flights a little over two weeks before departing. I decided to check the Singapore Airlines website to see what Premium Economy would have cost had we been paying. 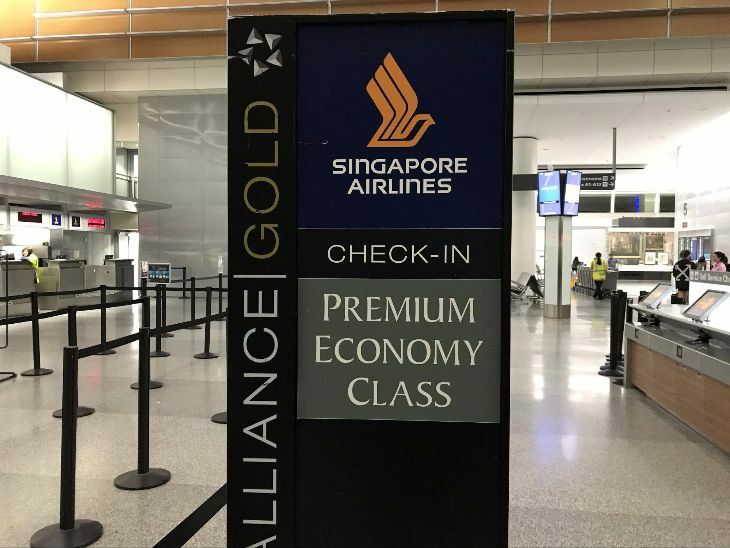 Singapore Airlines typically offers an Economy Saver fare, an Economy Flexi Saver, an Economy Flexi, and a Premium Economy fare. This close to the departure date, only Economy Flexi and Premium Economy were available, so the price difference was negligible. However, Premium Economy was a huge saving as compared to Business. I took a look at what costs would look like for the Economy vs. Premium Economy on several different dates, and my overall finding was that Premium Economy was just slightly more expensive than Economy, if not cheaper when booking within a month of departure, as the Economy Saver fares were no longer available. 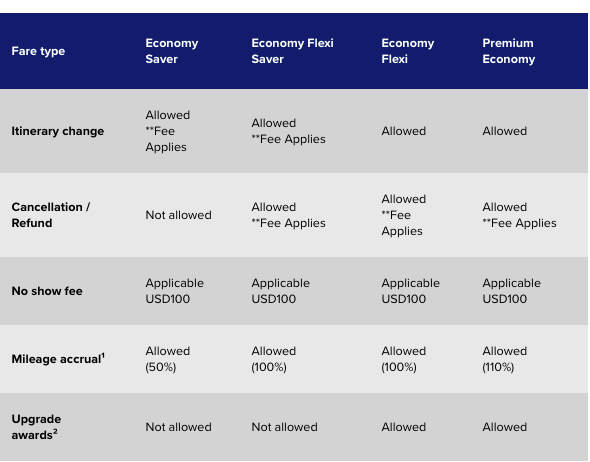 However, if you’re booking over a month out, Premium Economy is several hundred dollars (~$600+) more expensive than the Economy Saver fare. 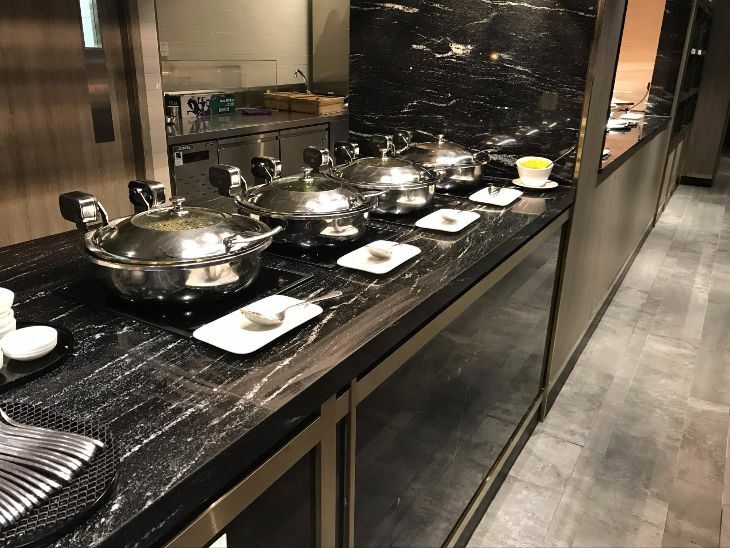 About a week before departing, Mamma Rhodes and I scoped out our meal options via the Book the Cook option which allows you to reserve a main course prior to the flight and has a larger number of options than you’d get onboard. We both chose the grilled chicken option for dinner. For some reason, we couldn’t select a breakfast option for the departing flight, but we could for the return flight. A few days later, it was go time! We arrive at the airport at 11:30pm on Sunday, July 23. We’d decided to check bags, so we headed straight for the Premium Economy lane. There wasn’t a single person in front of us, so we breezed right through. 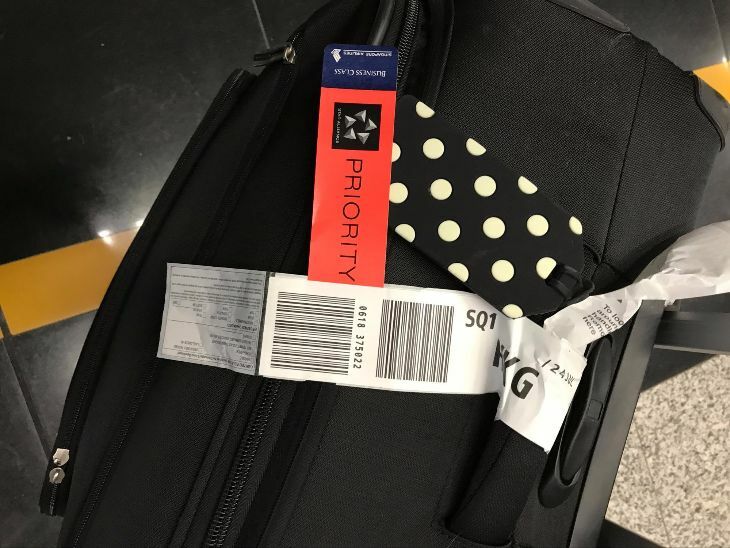 Our bags received priority tags, and then we were off to security. We flew through security thanks to my good friend TSA PreCheck, which, fortunately Singapore Airlines is a part of. Unfortunately, Premium Economy doesn’t qualify you for any lounge access, so we took a seat by the gate and waited to board. 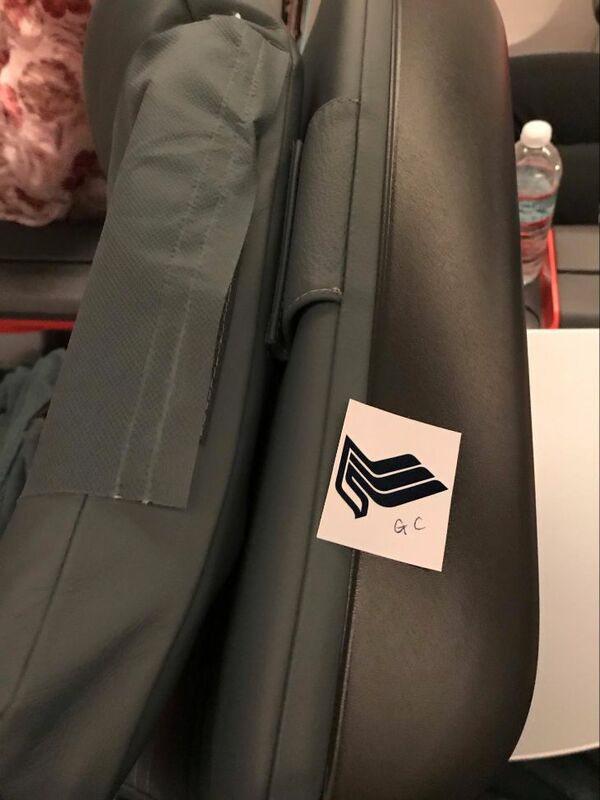 With Premium Economy, we received priority boarding. Once onboard, we headed for the Premium Economy section, which consists of 28 seats in a 2-4-2 setup. By the time we booked our tickets, all of the 2s except for the ones at the bulkhead had been booked up. 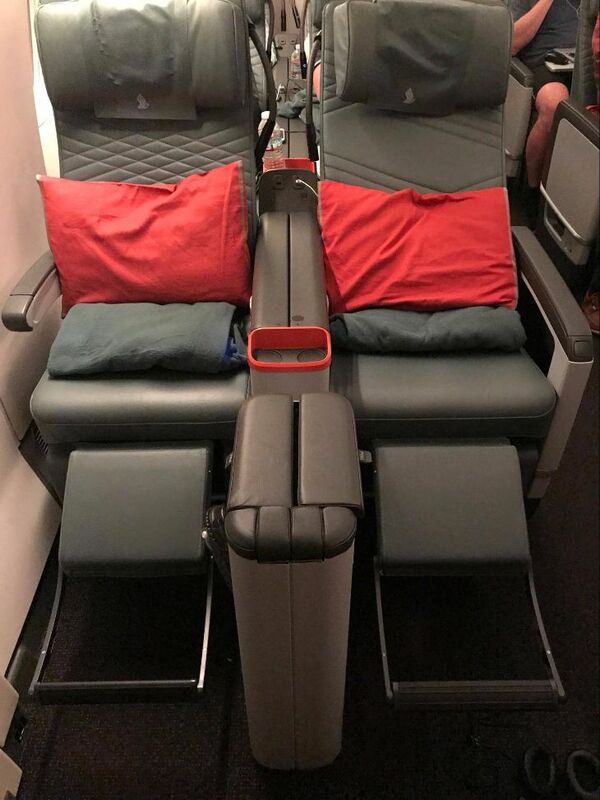 Luckily, Singapore Airlines agreed to let us take two of the bulkhead seats, even though they are considered premier seats due to the extra legroom. 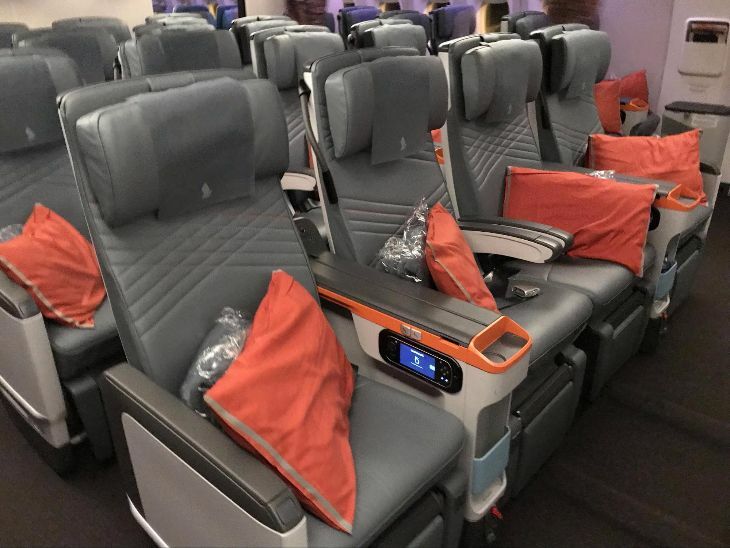 Premier seats in Premium Economy. That’s a mouthful. We took seats 31H & K.
I took the aisle seat, while my mom took the “window” seat. I say “window” in quotes, because this seat doesn’t actually have a window, hence the red rating on Seatguru. I noticed that many seats, including the D and G aisle seats had metal bars down the middle of the foot space. 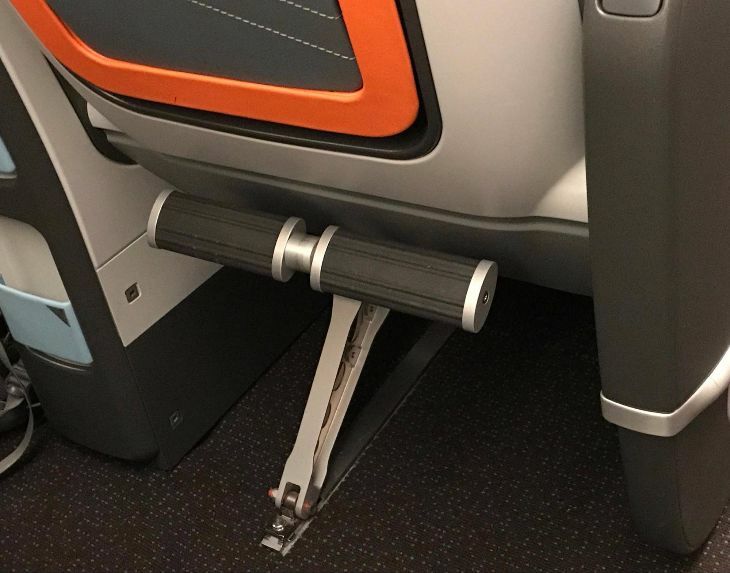 This wouldn’t be bothersome if you have your feet up on the footrest, but you wouldn’t be able to store a bag under the seat in front of you. I took my seat and immediately decided to test every widget. Overall, our bulkhead seats were incredible. There was tons of room and because there is no bathroom or galley near the bulkhead, people don’t end up congregating there, which I’ve always found to be an issue with bulkhead seats. I would highly recommend these seats if you’re flying premium economy as the people in other seats looked quite a bit more cramped. My only complaints about the seats themselves are that getting the seat to recline and getting the screen out of the armrest was way more challenging than it should have been. 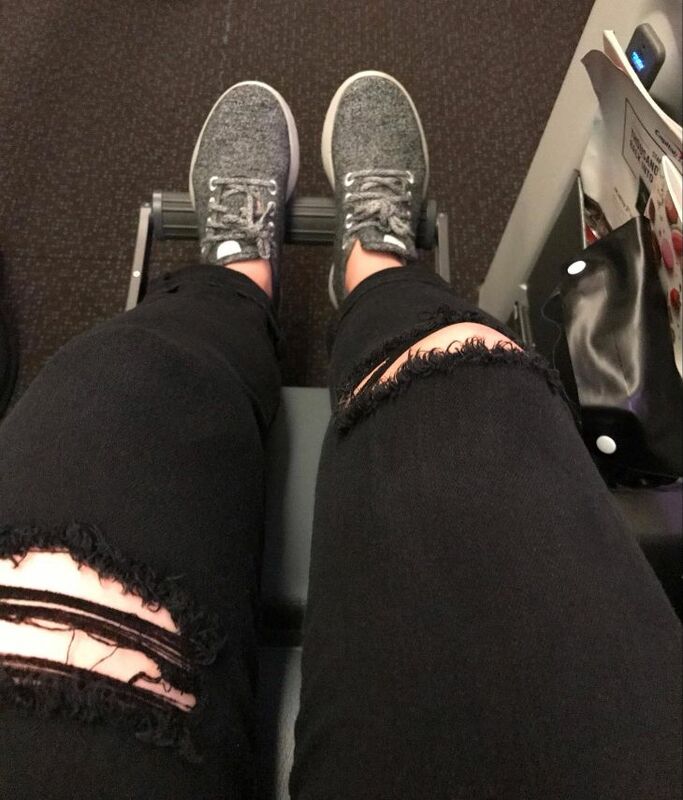 To get the seat to recline, I had to put my footrest up and have my feet fully planted on the ground to get enough leverage to push the seat back. 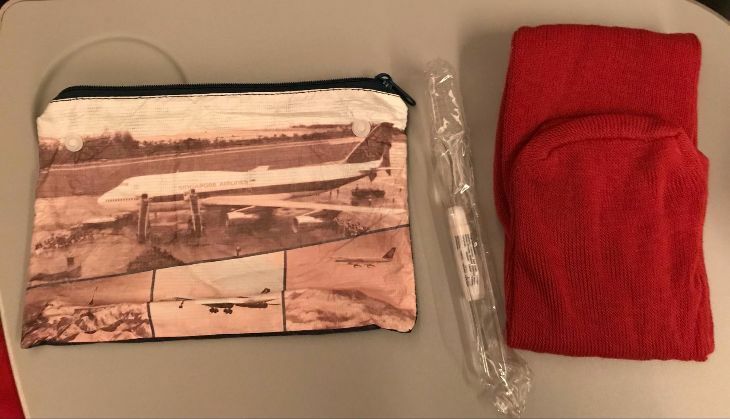 Shortly after take-off, flight attendants came around with water bottles and amenity kits containing socks and a toothbrush and toothpaste. Nothing special, and I left mine onboard unused. I turn into a pumpkin by 10:00pm, so the 1:15am takeoff was pretty brutal for me. Let’s not even talk about the fact that I had just left my bachelorette party weekend hours before the flight. Needless to say, I was not feeling my best. In an attempt to stay awake, I decided to peruse my entertainment options. The screens were large, the picture was high quality, and I had more options than I could possible take advantage of. 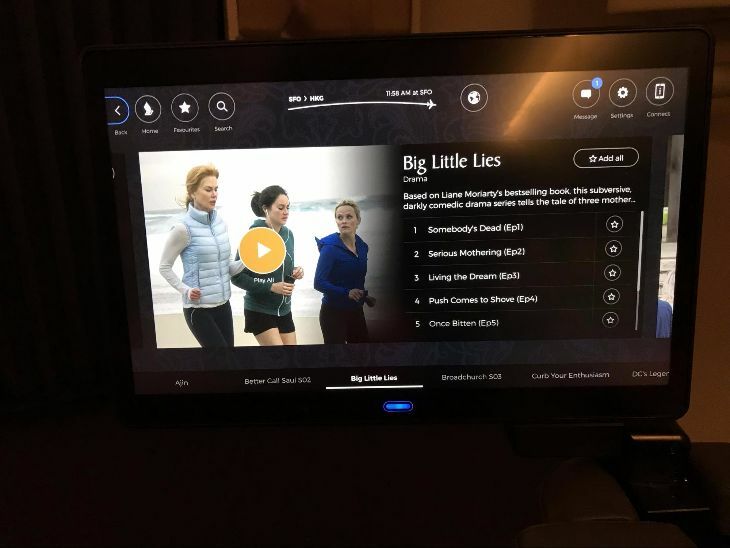 I decided to watch Big Little Lies. 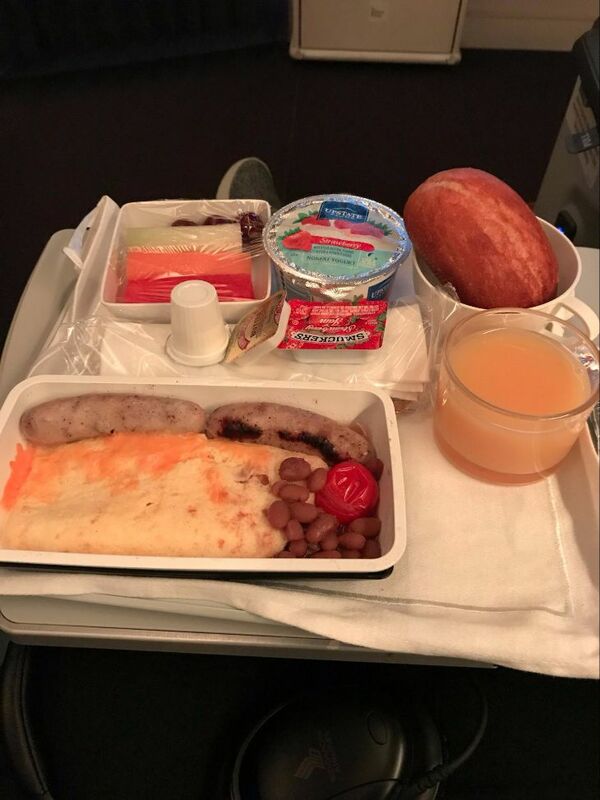 About two hours into the flight the first meal service began. 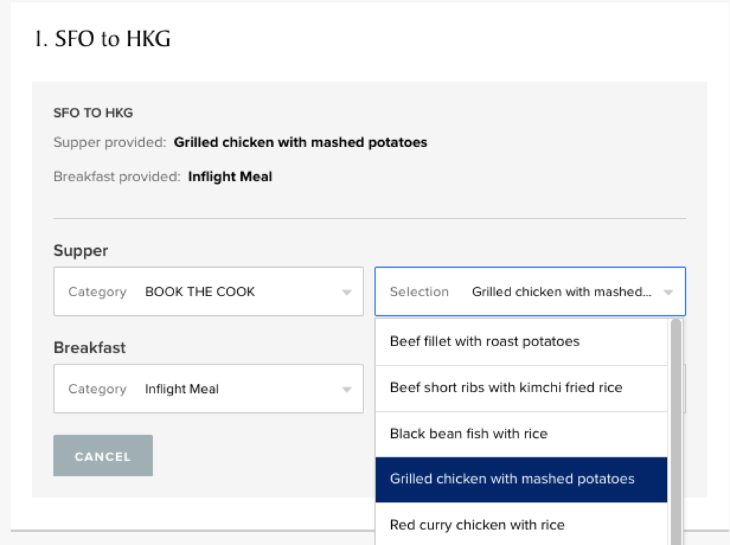 Though a sticker had been placed on my seat with my Book the Cook selection, they initially offered me the standard inflight options and I had to remind them I’d ordered the grilled chicken. The appetizer was smoked chicken with roasted corn and borlotti bean salad, the main course was my previously selected grilled chicken, there was a roll and butter, and dessert was mango mousse. Dinner was by far the standout meal. 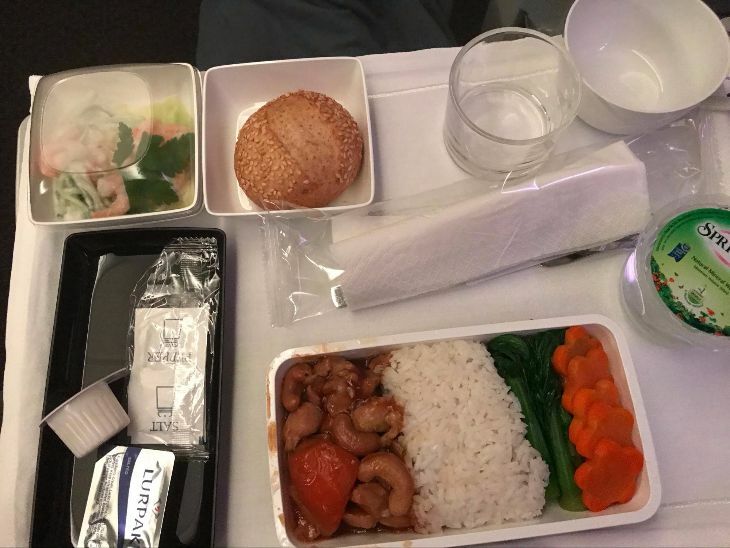 It was much more similar to an Economy meal than a Business Class meal, but the food on Singapore Airlines is always a cut above typical airline food. With the exception of the chicken and corn appetizer, which I just could not get behind, the meal was perfectly fine. The Premium Economy cabin is located behind business class, and in front of regular old Economy. However, the cabin shares the restroom with Economy. As someone who makes it my personal mission in life to stay hydrated on long flights, I would have loved to have a bathroom dedicated to the Premium Economy cabin to minimize wait time, but I guess you can’t have it all! Finally, it was time for some post-bachelorette party relaxation. You know what happened next. Step 1: secure neck pillow…. Given the small size of the cabin, it was incredibly quiet the entire time making it very easy to sleep. I woke up right at snack time where I was able to choose between a vegetarian tortilla wrap with roasted eggplant and sundried tomato hummus spread or a jerk chicken sandwich. 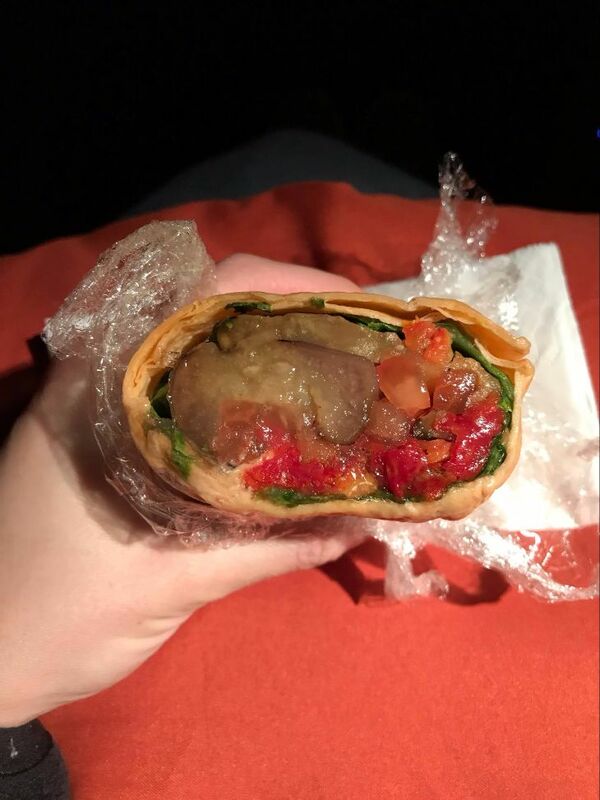 I selected the vegetarian wrap, had about half a bite, and trashed it. Not their finest dish. About two hours before arrival, breakfast was served. I had the omelette, which was slightly better than a typically Economy breakfast. About 13 hours later. We arrived in Hong Kong. After clearing immigration, we headed to baggage claim. Given that our bags had been given a priority tag, they were already circling the carousel by the time we got there. Next, we headed to our hotel. 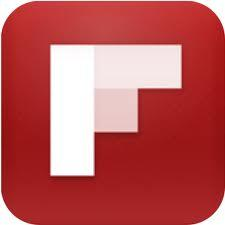 As I mentioned, our flight left SFO at 1:15 am on Monday. This had us arriving in Hong Kong around 6:30 am. I typically avoid flights like this at all costs, because then you’re stuck with all of your stuff, tired from a long flight and time change, with no hotel room until about 2-3PM. 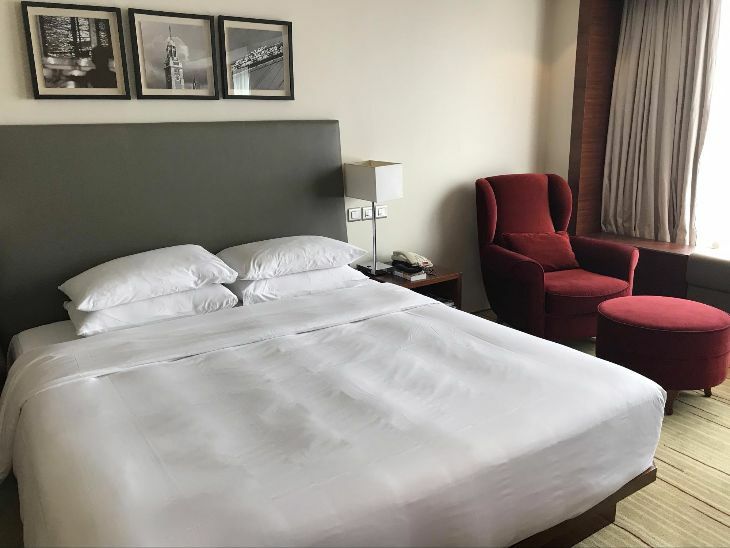 Between the bachelorette party and flight, I knew I’d be exhausted by the time we arrived, and that the thought of hitting the town right away would be miserable, so we decided to bite the bullet and got a hotel room for Monday night so we knew we’d be able to rest as soon as we got in. We took a taxi to the Hyatt Tsim Tsa Shui, where we stayed for the duration of the trip. 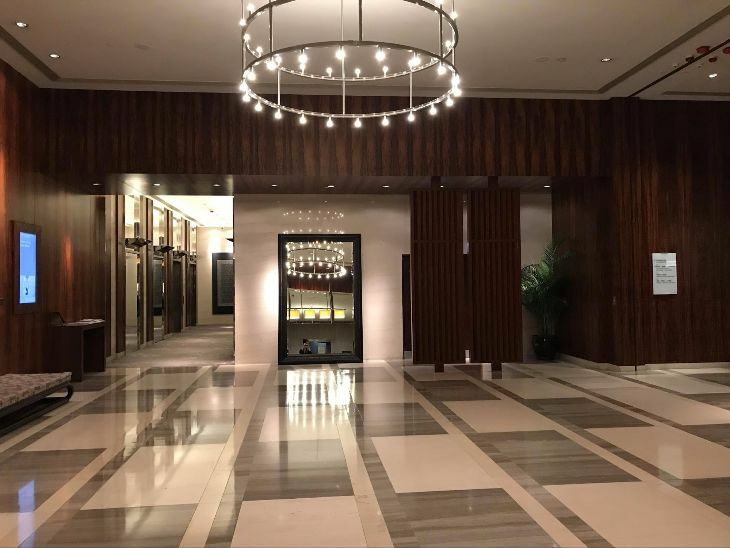 Thanks to the combination of points I had from my Chase Sapphire Reserve card and an award night I had from my Hyatt credit card, the entire stay was free. Five days later, it was time to head home. 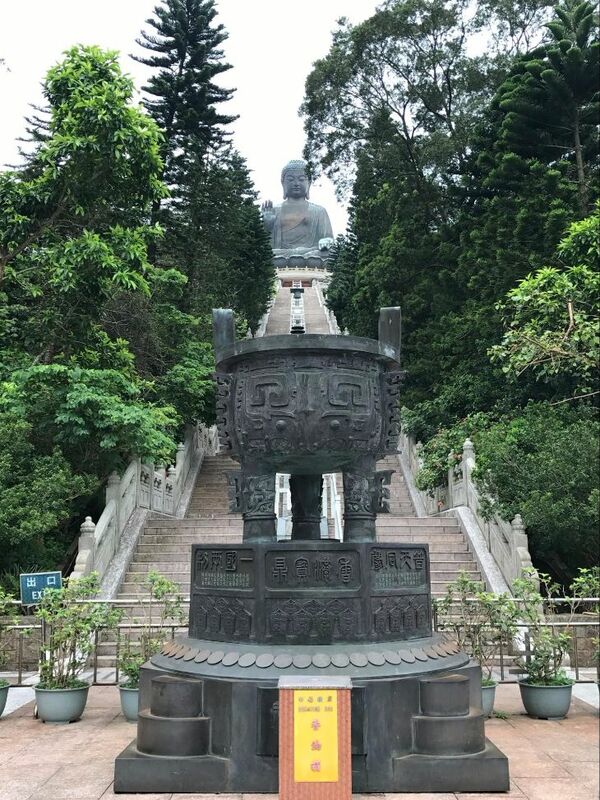 Our return flight was scheduled to depart HKG at 11:30pm. 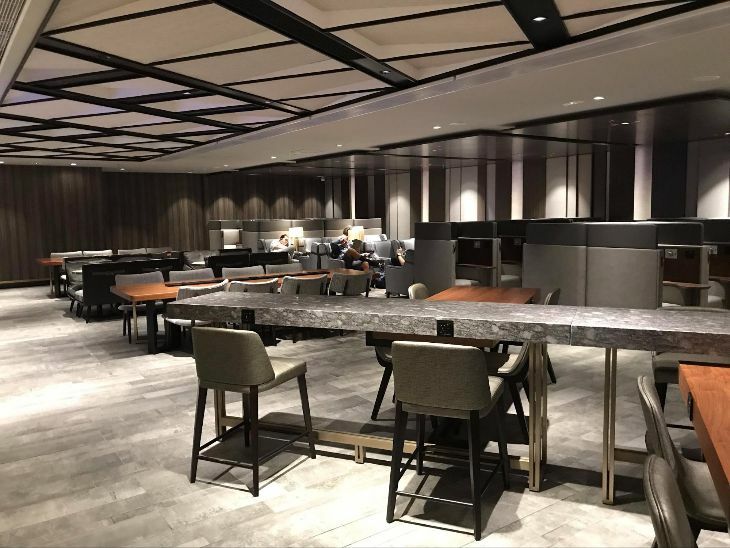 Once we checked in and passed through security, we decided to head over to the Plaza Premium Lounge, which we had access to courtesy of the Priority Pass I have via Chase Sapphire Reserve card. I swear, nobody asked me to promote the CSR, I just really love it! 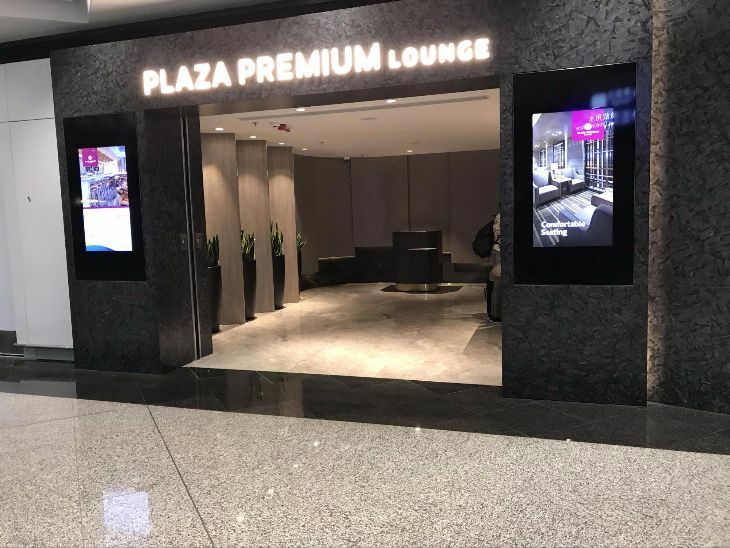 We were especially glad that we had lounge access when we found out our flight had been delayed until 12:15am. At around 11:30 we headed to the gate. We were told the boarding time was now 12:05 am and estimated departure was 12:15 am. I’m pretty sure anyone who has ever been on a plane knew that it would be impossible for the entire plane to board in 10 minutes, and I found the lack of a realistic departure time frustrating. At 12:05am we boarded the plane. We took off around 12:45 am. We had the same seats as we did on the way to Hong Kong, and we enjoyed them once again. This time, I pre- selected the cashew chicken for dinner, and vermicelli and dim sum for breakfast. Dinner was served at around 1:30 am. I wasn’t very hungry so just had a few bites. It wasn’t as good as my grilled chicken but was a decent option. I then slept and woke up for snacks and a movie about five hours later. 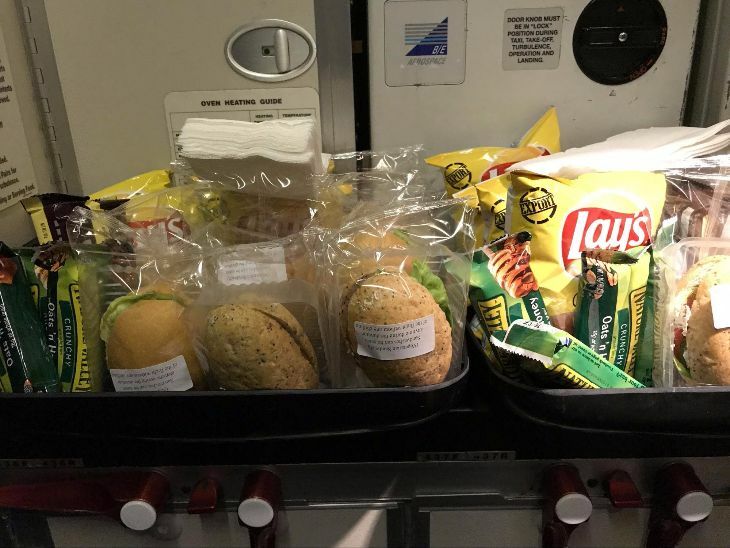 There was a basket full of snacks including sandwiches, chips, chocolate bars, and granola bars in the galley for Economy and Premium Economy passengers. 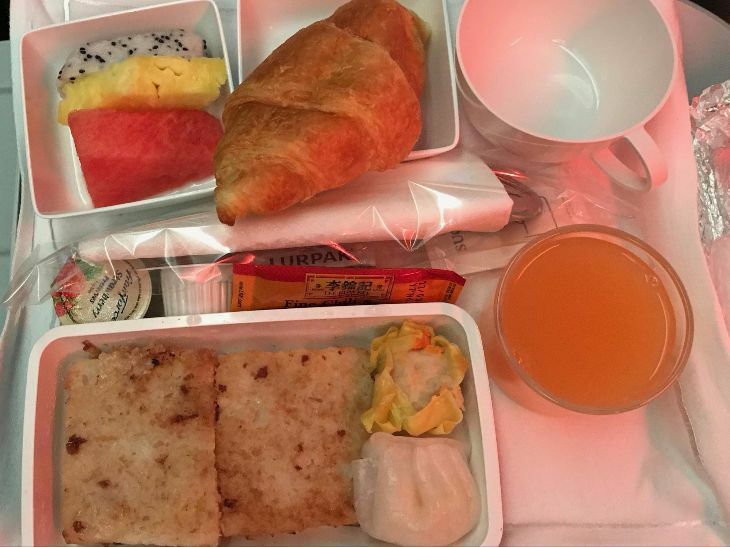 Breakfast was served two hours prior to landing. They definitely have some kinks to work out around Book the Cook as I was initially served the wrong meal despite having a sticker with my selections clearly placed on my seat. 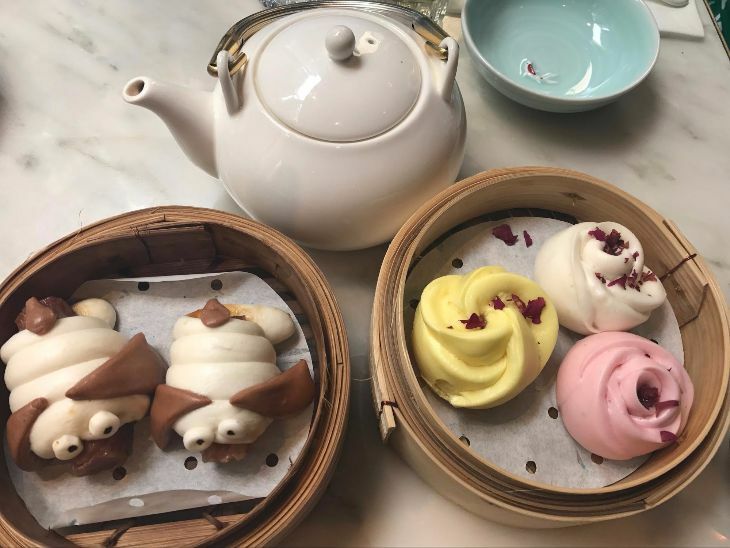 I had the dim sum, though was supposed to have a noodle and dim sum dish. The steward brought the other dish about 20 minutes into the meal service, by which time I’d already eaten my first meal, so turned I turned it down. Before I knew it, we were home sweet SFO. All in all, Premium Economy is a significant upgrade from Economy, and is worth the price of admission. The real draw here is the more spacious and comfortable seats, in a small and therefore quiet cabin. To me, everything else from the amenity kits to using Book the Cook are just gimmicks with some marginal benefits. I think I can sum up our experience with one anecdote. 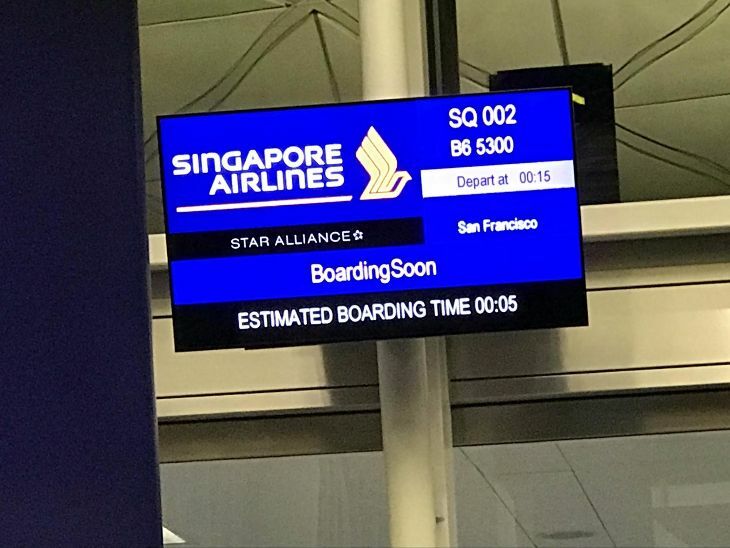 It was the flight from SFO to HKG. We were about 2 hours from landing and breakfast was about to be served. 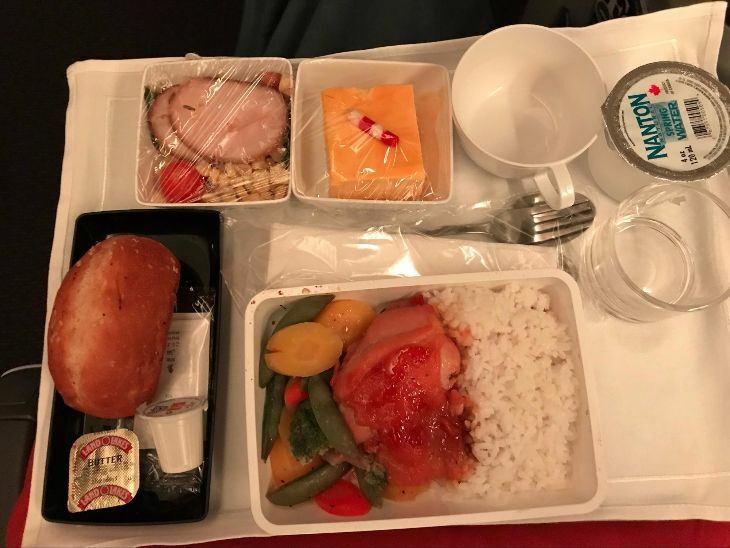 My mom woke up, looked at me and said “Did I miss dinner?” to which I responded, “Yes, Mom, it was 9 hours ago.” So, if you want 9 hours of undisturbed sleep for a fraction of a Business Class ticket, Singapore Airlines Premium Economy is the way to go! Thanks again to Chris and Singapore Airlines for selecting me for this trip! 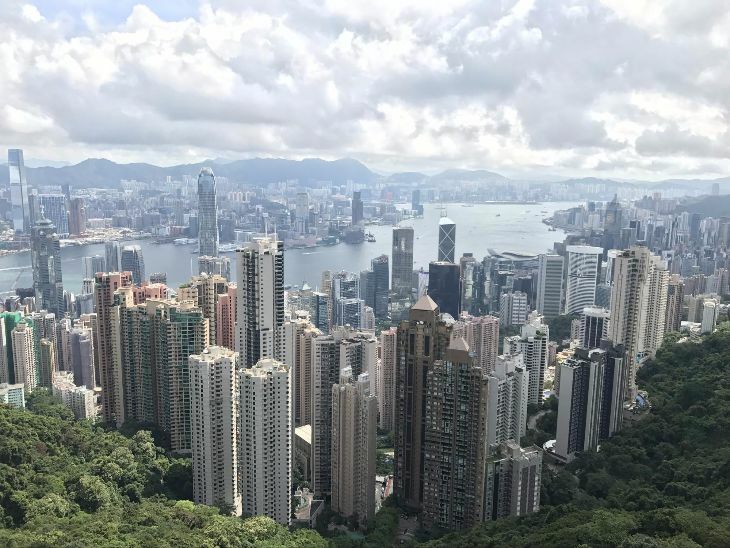 I am confident that I’ll be telling the story of how I won a trip to Hong Kong for the rest of my life, and am so grateful to have been able to share this experience with my mom. I would have gladly sat in the lavatory the entire flight for the opportunity to take such an incredible trip with her, but Premium Economy was far more luxurious. 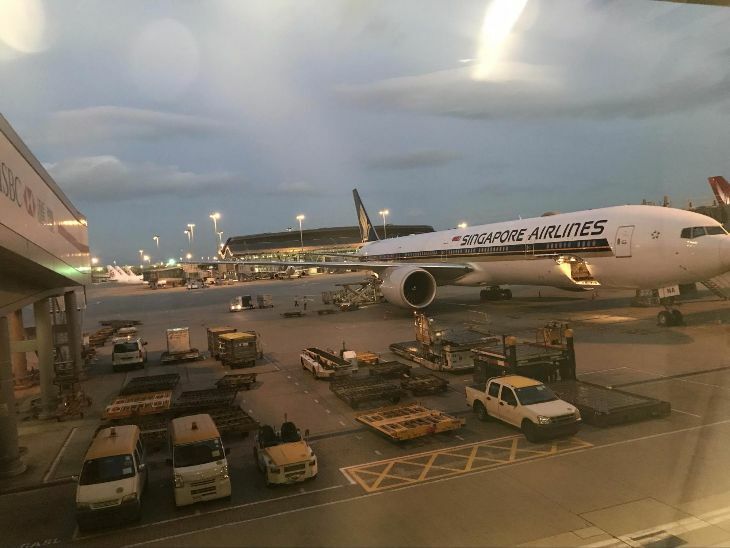 Have you flown on Singapore Airlines lately? 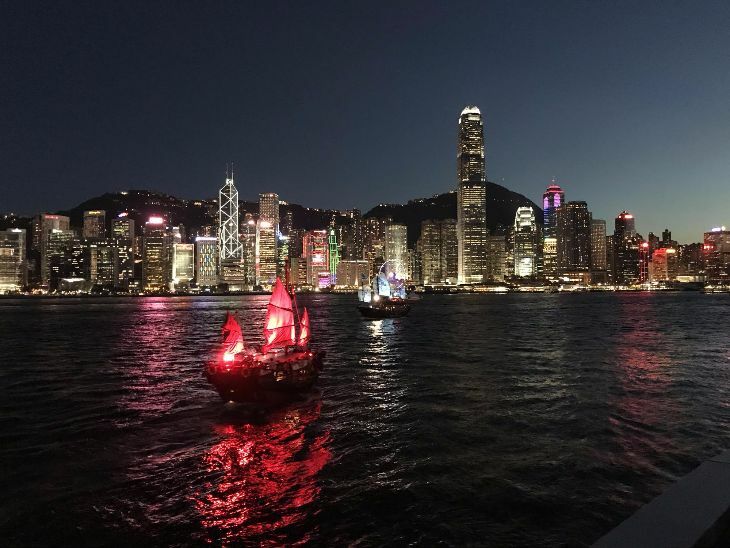 Traveled to Hong Kong? Please share your experiences and advice below. Or give kudos to Lacie for a great job on this Trip Report! Disclosure: Singapore Airlines provided air transportation in premium economy class for Lacie and a companion as a prize in this contest. Lacie paid for all other components of this trip.